There are many, many things here that could make me C.R.A.Z.Y. What with the pickpocketing, the unknown mystery meats, the lady at the tomato stand yelling at me because I touched her goods….the list goes on and on. But the thing that has really gotten to me, believe it or not, is living in a place with naked white walls. Besides the fact that I can see every single speck of dirt and dog slobber, it’s just so…..white. Hospital-y. Psycho ward-y. As if they are afraid that colorful walls would make the wacky Americans in the building (who work nights, walk a hound, and pick up his poop) even more wacky. We made a pact when we moved here that we would minimize the amount of money we spent on household goods. It is not-so-smart to buy a bunch of stuff that I will only use/see for a year. So we have lived in naked white walls for nearly SIX solid months now. I have also saved most of the cards people have sent us (you people ROCK, by the way, on sending us mail. Other American ex-pats here are jealous of our fan club. 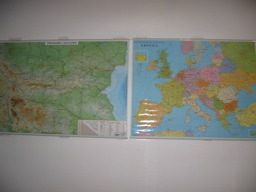 And we looooooooooooooooove getting mail!!) 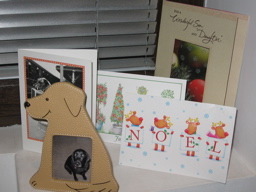 and made a little display of them–which also includes a photo sent by my niece/nephew of our other hound at home, Lola. We just need to bring back a picture of Dakota and we will be all set–to love our dogs from afar, while they have forgotten our very names. And finally, so I can mark the days off with big red Xs keep track of the time here, I found a half-priced calendar. 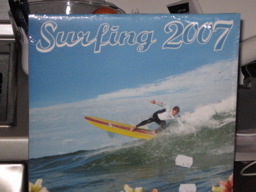 Who knew this San Diegan would find a SURFING calendar in a land-locked, post-Communist, Eastern bloc country? Heh. Heh. The entire cost of my interior design was $12 U.S. Dollars. I had to be cheap, you know…….because I spent all that time yesterday handing out cash to all the gypsies.